For our fifth and final challenge as a cohort, we asked the question, “How might we better serve immigrant entrepreneurs and business owners?” Our partners on this project were ProsperUS Detroit, a place-based economic development program that focuses on supporting and empowering low-income, minority, and immigrant business owners in Detroit’s neighborhoods. Our teams were focused primarily in the Southwest Detroit neighborhoods. 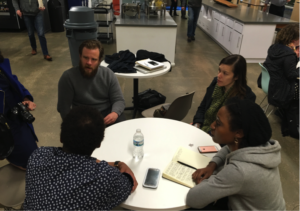 Teams were split up based on ProsperUS Detroit’s various programming: micro-lending, business services, and the training program. The fourth team was charged with searching for the gaps and needs in ProsperUS Detroit’s programming as a whole. 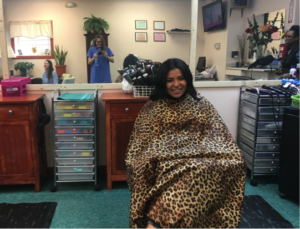 The teams visited and patronized local businesses as a part of their empathy work. Throughout the process, we were continually inspired by Raquel Garcia from Global Detroit’s statement that Detroit is “resource rich, but connection poor.” Our teams were charged with making a communications toolkit, which could be used to build the connections Raquel spoke of, to connect business owners to the resources that are available to them. One of the major themes that came out of these discussions and interactions within the community is that people do not connect with the word “entrepreneur”. To this point, there isn’t even a word that directly corresponds to “entrepreneur” in Spanish. Another theme that emerged is the idea of family or community support network and a distrust of banking institutions. The teams also learned that word of mouth and personal stories of connection are highly valued by the Southwest Detroit business community. Teams took the information they gathered during their time spent in the community to create a range of recommendations for ProsperUS Detroit. 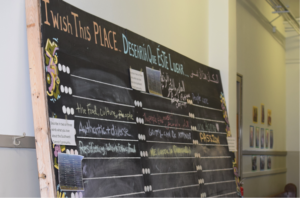 Teams visited St. Anthony Nonprofit Center, where a board displays and activity where community members shared their collective dreams for a space. The Micro-Lending Team created a social media storytelling campaign, called #PeopleofProsperUS, to share the stories about the experiences of immigrant entrepreneurs who have received loans through the program. The Business Services team created a bilingual recruiting strategy using the slogan “¿Cuál es tu pasión?” with a focus on print media over digital media. They also created a list of bilingual service providers in areas such as accounting and marketing. The Training Team created graphic designs for window decals that could be placed in the windows of businesses that have previously participated in the training program. 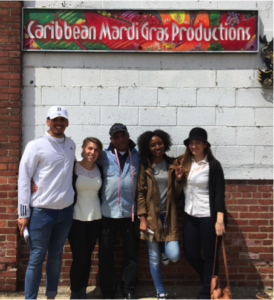 The Needs Discovery Team shared a strategy to create an informal network through a series of informal gatherings with shared food and conversation where past program participants could connect with future program participants over a shared meal or drink. The Micro-Lending Team meets with stakeholders. The recommendations and strategies that the teams shared with ProsperUS Detroit were created using the design thinking process as a tool. The initial time that fellows spent in the community is part of this human-centered design process which uses empathy as the basis for defining the problem and eventually creating prototypes. As we wrap up this challenge we are excited to see how the strategies and recommendations that the fellows have shared with ProsperUS Detroit are implemented.